Welcome back for another week of Fantasy baseball. This marks our final installment of the Wire Troll for the 2018 MLB season. We trust that our recommendations helped steer you in the direction of Fantasy baseball glory! This week, Addison Russell is away from the Cubs for now with more details coming out about his alleged domestic abuse; the Red Sox did the worst thing imaginable for Yankee fans, clinching the AL East on the Yankees’ field; and Luke Voit became the 12th Yankee with double digit dingers this year — a new MLB record. 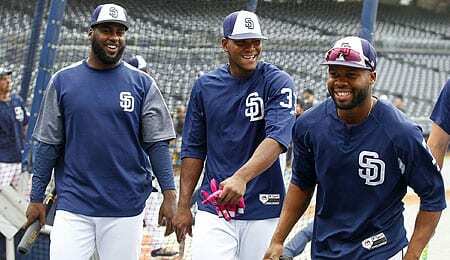 Franmil Reyes, OF, San Diego Padres (ESPN: 24.1 per cent; CBS: 29 per cent): Reyes stroked a pair of hits, drew a walk and scored twice Wednesday to run his hit streak to 11 games. No, he hasn’t been bashing homers like he did in August (although he recently snapped a dinger slump), but there’s nothing wrong with his .375 BA this month. Reyes has quietly put together one hell of a rookie effort in a half season of play, especially feasting on righties (.358/.434/.657). This Dominican behemoth (6’5″, 275) was averaging nearly a run per game and ranked fifth in the entire minor leagues in exit velocity before getting summoned from Triple-A in mid-May. Yes, there are rumblings that his reported age of 23 is incorrect, but regardless of how old he is, he’s proved he can mash, and is worth owning down the stretch. Seems like an affable chap, to boot (see video below). Ty Buttrey, RP, Los Angeles Angels (ESPN: 24.2 per cent; CBS: 14 per cent): Need some saves in the final week? Try Buttrey, a virtual unknown until he started bagging saves in Disneyland a couple of weeks ago. Now he’s on a run of eight straight scoreless outings, and he’s looked almost unhittable since reaching the majors just over a month ago. Judging by what Buttrey did at Triple-A, his K rate of 11.15/9 seems sustainable, and we love the fact he’s basically maintained his minor league walk rate. Alex Gordon, OF, Kansas City Royals (ESPN: 21.2 per cent; CBS: 14 per cent): Forgot about this one-time Fantasy stud, didn’t you? Gordon raked three hits and drew a walk on Friday, giving him hits in six of the last seven games, during which he’s lashed four doubles and driven in eight runs. After bottoming out in July, he bounced back in August with a season-high 15 runs and 15 RBI and has built on that with his best month in September (.280 BA, .360 OBP with 15 RBI already). On a thinner Royals team, Gordon is seeing more action this year, and he’s actually managed his most productive season since 2014. Despite three straight years of being a below average player, at the very least he’s worthy of a roster spot to wrap up 2018. Curtis Granderson, OF, Milwaukee Brewers (ESPN: 2.3 per cent; CBS: 6 per cent): Another veteran flyhawk that’s having a bit of a renaissance is Granderson, who has been starting more often lately. He hasn’t been doing a ton with the extra reps (0-for-5 Friday with a whiff, although he was robbed of a hit thanks to a diving grab from Pablo Reyes). Still, Granderson is enjoying his best month since June, and overall, has hit much better this season despite his highest strikeout rate and worst plate discipline since 2013. He’ll be a somewhat useful NL-only asset the rest of the way. Adam Wainwright, SP, St. Louis Cardinals (ESPN: 17.4 per cent; CBS: 31 per cent): To wrap up our theme of vets making a last stand, how about Wainwright’s six shutout innings with nine punchouts against the Dodgers on Sunday? He looked very rusty in his first start back after an extended elbow-induced DL stay, but was in vintage form last weekend. Wainwright’s WHIP is a career worst through a half-dozen starts, but he’s trending in the right direction and has a great matchup Saturday against the punchless Giants. In a small sample size, he’s inducing far more infield flies this year, but is giving up balls to centre field at a higher rate than ever. Less than a day after winning the AL East in all places but Yankee Stadium, the BoSox machine rolled on Friday, matching a franchise record with win No. 105, originally set 106 years ago. After a rough outing against the Jays, CC Sabathia had his cutter working Friday, turning in a quality start to move over .500 on the season. It’s the best he’s looked in almost a month in what’s mostly been a meh season other than a beefed up K rate — his highest since 2014. It’s been a bit of a disappointing year for Astros first baseman Yuli Gurriel, but he’s finishing strong. After driving in a career high seven runs on Friday, he’s now 20-for-61 in September, hitting safely in 15 of his last 17 starts, including seven straight. Gurriel has actually done a better job in the counting cat stats this season, setting a new career best in ribbies and closing in on his personal high in runs. Chris Sale wasn’t at best Friday (despite seven Ks in just 3 1/3 IP), but he’s now stretched out to 73 pitches as he continues to work towards solidifying his status as the playoff opening game starter for the Red Sox. Believe it or not, Friday marked the first runs he’s surrendered since July 6. What a stiff, eh? This entry was posted on Saturday, September 22nd, 2018 at 2:52 pm	and is filed under BASEBALL, RotoRob, The Wire Troll. You can follow any responses to this entry through the RSS 2.0 feed. You can skip to the end and leave a response. Pinging is currently not allowed.